Red lentils simmer with onions, garlic and spices, then pureed for a creamy consistency. Chard added for additional color and nutrition. Vegan recipe. Heat 1 tablespoon olive oil in a large pot on medium medium heat. Add the onion, cook for a few minutes until it begins to soften. Add the carrots and celery, followed by the garlic. Cook for another minute or two, then stir in the lentils with the other tablespoon of olive oil. Add the dried spices at this time–cumin, coriander, cinnamon, and cayenne. Stir to combine. Add the broth and water to the pot, bring to a boil. Reduce heat to simmer uncovered. Add the bay leaf and the soy sauce. Simmer uncovered for at least 20 minutes, until the vegetables and lentils are soft. As the lentils are simmering, bring a large pot of water to boil. Add the chard, and boil for 3 minutes. Drain the chard, and press out the excess water from the chard. Set the chard aside. When the lentils and carrots are soft, purée the soup using a handheld blender. Alternatively, transfer the soup into a food processor to purée in batches. I like to leave a bit of the lentils and carrot pieces for consistency. Stir the cooked chard into the puréed soup. Add salt and pepper to taste. 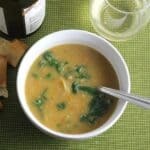 Heat the spicy lentil soup with Swiss chard for about 5 minutes to let the flavors meld. Serve hot and enjoy!